Visitors to the Old Market Square will be able to take part in three different sports this weekend; with teams from Triathlon, Table Tennis, and Tennis visiting to promote major sporting events coming to the city in June. The fun starts at 10:30 am each day and lasts until 4pm. There will be chances to try the sports, talk to the coaches, find out about some major international events, and to meet some sports stars as well as prizes to be won. You can even celebrate the Royal Wedding! On Saturday 19 May, the square is the venue for the national launch of this year’s Ping! project. The Old Market Square will be transformed into a table tennis playing arena, complete with ping pong robot and customised novelty tables. Fresh from her Gold Coast Commonwealth medal winning performance, University of Nottingham based Maria Tsaptsinos will take on former European Youth champion and local coach Gavin Evans in an exhibition match and will be willing to take on any passers-by who fancy their chances. As it’s also Harry and Meghan’s special day, in their honour, look out for a game of ‘Royal Wedding Round the Table’, everyone is welcome to take part. The Ping! 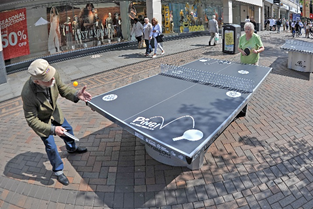 project – now in its ninth year, is all about getting people active and having fun by introducing table tennis tables into everyday public spaces. There will be over 30 tables placed all over the city with an invitation to grab a bat and ball and play for free. Joining the Ping! team on Saturday will be teams from GOTri and the Triathlon Trust. They will be explaining how to get involved in Triathlon and telling people all about the Accenture World Triathlon Mixed Relay Cup which will take place on Victoria Embankment on the evening of 7 June with Olympic athletes battling it out for places to compete at Tokyo 2020 . There will be details on how to book tickets for the best view in the Grandstand and the team will also offer advice on how to take part in triathlons with bike tasters on Saturday and bike and running tasters on Sunday. On Sunday, the triathlon teams will be joined by coaches from the Lawn Tennis Association (LTA) and Nottingham Tennis Centre as we look forward to the Nature Valley Open international tournament coming to the city between 9-17 June where players warm up for the grass court season and The Championships, Wimbledon. There will be chances to play tennis and test your skills on the pop up courts and to find out all about what is planned for the tournament, including the Family Fun days over qualifying weekend and Ladies Day on 13 June. 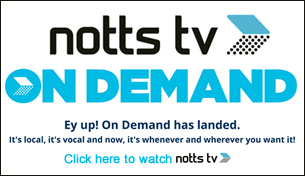 Find out about other events at Nottingham Tennis Centre and pick up a voucher for a free tennis trial too! Cllr Dave Trimble, Portfolio Holder for Leisure and Culture said; “I’m looking forward to getting involved in the sports on offer this weekend as the Old Market Square becomes a mini sports arena. It’s great to get people involved and interested in playing sport and it can often be at little or no cost. Ping! is the creation of Sing London – the arts organisation whose work aims to lift the public’s spirit – and is funded by Sport England with the aim to get more people physically active. Ping! is managed by Table Tennis England, the sport’s National Governing Body, and is delivered through a range of partnerships with City Councils, Local Authorities and County Sport Partnerships with hundreds of community groups, businesses and volunteers creating the Ping! experience at a local level. The Lawn Tennis Association (LTA) is the National Governing Body for tennis in Great Britain, responsible for developing and promoting the sport, with a mission to get more people playing tennis more often. It does this under the consumer brand of British Tennis, by working with a broad range of partners and over 25,000 volunteers, to grow the game in communities, clubs and schools. The LTA represents the interests of over 590,000 British Tennis Members, men and women, girls and boys across the country, playing on more than 23,000 courts.